Okidata’s innovative line of textile transfer printers offers exceptional versatility for digital garment decoration. OKI LED print technology is the foundation of today’s laser transfer revolution. The unique benefits of the Oki print engine support pass-through printing and low fusing temperatures that make self-weeding laser transfer papers work so well. The OKI 711WT and 920WT introduced the benefits of white toner for effective dark garment decoration. The Pro 8432WT condensed the 920WT’s tabloid size output into a more lightweight package. The latest advancement from the OKI Pro series brings a broader color palette and more economy to tabloid size textile transfer printers. The Oki Pro 8432WT is now available with five toner cartridges for black & white toner swapping. 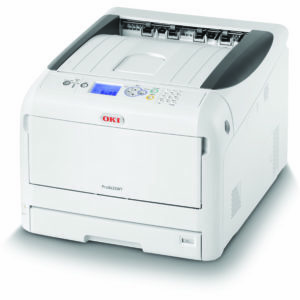 The OKI Pro 8432WT LED laser printer accommodates heat transfer materials up to 11″ x 17″. It can also print on standard media up to 13″ x 19″ and 11.6″ x 52″ banners. Despite the larger output, the OkiPRO 8432WT weighs only 81 lbs – less than half the weight of the 920WT. The Pro 8432WT comes bundled with advanced print drivers for MAC and Windows. The optional Forever TransferRIP software simplifies the deign process, reduces cost and includes powerful features that enhance the feel and durability of your textile transfers. TransferRIP is compatible with Windows 7/8/10. OKI WT laser transfer printers offer astounding versatility and value. They combine the best of several other digital garment decoration technologies but offer unique benefits. Like sublimation, OKI printers can be used to decorate hard-surface, non-textile items like mugs and mouse pads. But laser transfer doesn’t require a polymer coating, so your materials cost is lower. And white toner allows you to apply opaque, vivid graphics on colored or dark items: something impossible with sublimation. This goes for both hard surface items and apparel. Some direct-to-garment printers also decorate dark garments by using process color and white ink. DTG printers are used to print directly to dark apparel, primarily cotton. But the apparel has to be pre-treated before the ink will stick. And white ink in an inkjet printer requires regular use and daily maintenance to prevent costly damage to print heads. These drawbacks also come with a price tag of about of $15 – $30,000. 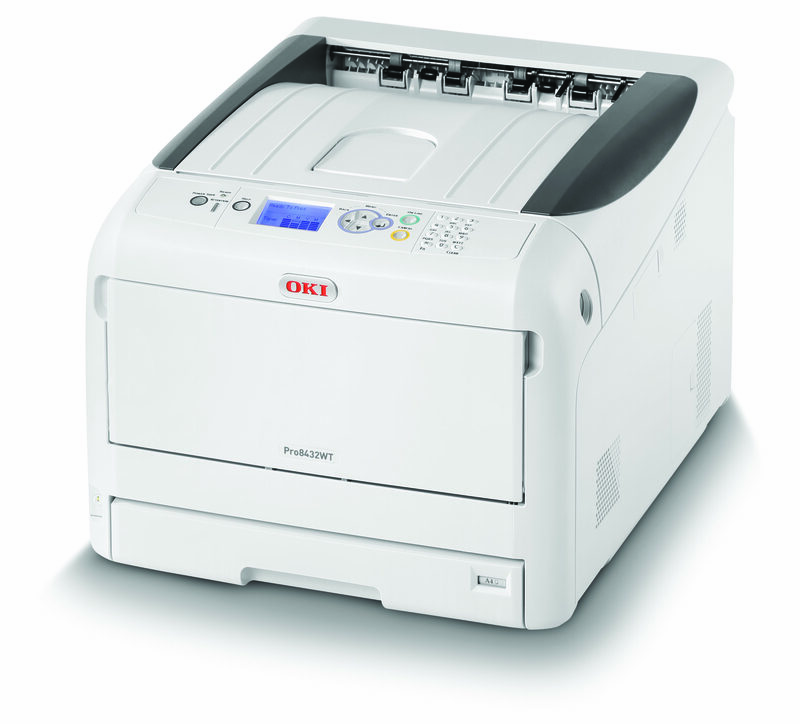 The Oki Pro 8432WT is a much more affordable and user-friendly alternative. Since it uses toner instead of ink, there are zero maintenance issues. No pre-treatment is required, and the initial investment is a fraction of the hardware costs of DTG. The only other digital garment decoration technology as versatile and economical as laser transfer is HTV. The HTV option offers unique benefits too for both spot color and process color. The attraction of laser transfer is the use of self-weeding papers that enable you to apply complex, intricate graphics to apparel without the manual weeding required with HTV. The 8432WT has been on the market for over a year, offering all of these benefits to smart garment decorators. The big news for 2019 is the addition of Black toner. The original configuration followed in the footsteps of the 711WT and Pro 920WT offering only a CMYW toner set: cyan, magenta, yellow, and white. This is a good solution for decorating dark garments. But for decorating white or pastel shirts, or for non-textile printing on standard papers, the CMYW toner set has two important limitations. The composite black produced by mixing cyan, magenta, and yellow is not as dark or opaque as that produced by black toner, so prints and transfers on white apparel and paper lack the contrast and visual punch of CMYK (Fig 1). Even transfers on black shirts can suffer from this if black toner is part of the design. The other disadvantage of composite black is cost. Using composite color is simply more expensive than using black. Both of these drawbacks have been erased by the addition of a black toner option for the Pro 8432WT. Near the end of 2018, OKI announced availability of black toner and drum cartridges for the 8432WT. New printers will be shipped with the five-toner and drum cartridge setup. If you already own an OKI 8432WT, and would like to add this feature, all you need to do is download an updated printer driver and ICC profile, and order a black toner and drum cartridge set. Like its little brother the 711WT, the OkiPRO 8432WT can be used for a wide variety of direct print and transfer applications. Here’s a quick summary of what you can do with one. Full color CMYK T-shirt transfers on white and gray apparel. Vivid color and opaque white transfers on colored and black apparel. Decorate various fabrics including cotton, polyester, cotton-poly blends, canvas, and more. Super soft, brilliant foil transfers in silver, gold, and several popular colors. Heat transfer applications on hard surfaces like coated and un-coated mugs, ceramic tiles, mouse pads, wood signs, leather, magnetic vinyl & more. Direct print to paper, card stock, transparencies, select heat transfer papers, and specialty papers including mini banners. If you’re starting from scratch, the best value is our OKI PRO 8432WT Economy Plus package that includes the printer, starter CMYW toner set, full Black toner and drum cartridges, self-weeding transfer paper, Gold Customer Care plus a big, heavy-duty EnduraPRESS SD20 swing-away heat press – all for only $7,495.00. If that doesn’t quite fit your needs, you can choose one of our other starter bundles. Or give us a call at 800-899-5655 and we’ll help you tailor something just right for your needs and budget. If you already own an OKI Pro 8432WT and would like to upgrade your printer, you can purchase the Black toner & drum cartridge bundle and get started printing more vibrant graphics and transfers. * Based on ISO/IEC 19798 test chart of A4 LEF sheet, simplex and continuous printing as reference yield. Yield will vary based on image, area coverage and print condition.